George Keremedjiev is president of Tecknow Education Services, Inc., Bozeman, MT; 406/587-4751, www.mfgadvice.com. George also writes the monthly Metalforming Electronics column for MetalForming magazine. “In the not too distant future, I see Kenmode Tool and Engineering becoming a worldclass industry leader in the development of sensors in our tools,” emphasizes company president Kurt Moders during a recent visit to the firm’s stamping plant in Algonquin, IL, to discuss its recent investments in in-die sensing. “Sensor technology is a fundamental part of our long-term strategic plan, which will enable Kenmode to provide outstanding value to our customers by improving the overall quality and consistency of our processes,” Moders adds. Kenmode sensor-applications specialist Harold Didricksen is seen in the firm’s sensor laboratory assembling military connectors. They’re used to connect sensors within the dies and to the press control system. There is something quite special happening at Kenmode, a 52-yr.-old production stamper/die shop rooted, like so many stampers, in tool and die manufacturing. From its humble beginnings as a two-person operation, the company now has 150 employees, scores of presses and a diversity of dies that supply more than 400 different parts to more than 100 customers. End-use markets include precision electronics, appliance, medical and automotive. Parts range from tiny precision stampings run at high speeds, to galvanized-steel automotive components such as windshield-wiper parts, clamps, brackets, and engine and brake components. Early in 2011, the company launched an electronic sensor program, to protect its dies and help ensure quality production, Step one: It named one of its toolmakers, Harold Didricksen, as its sensor-applications specialist. A graduate of Kenmode’s tool and die apprenticeship program, Didricksen is a journeyman tool and die maker with an Associates of Applied Science Degree in Manufacturing Technology. His positive attitude and strict sense of discipline and organization with the sensor program is infectious. 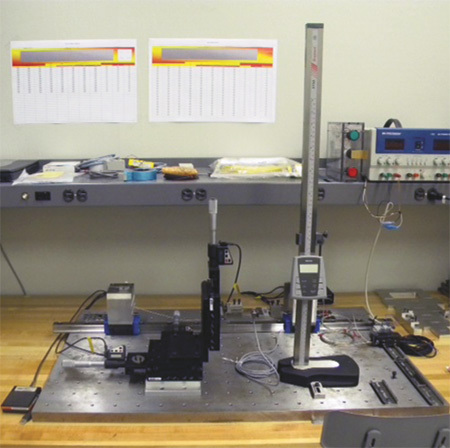 The sensor laboratory includes this three-axis micro-positioning table, equipped with all of the appropriate ancillary devices including digital micrometers, fixtures and specialized mechanisms to enable precise positioning of parts and sensors for experimentation. As Kenmode began to develop a formal sensor program from scratch, Didricksen set out to purchase all of the equipment needed to construct a sensor laboratory. He set up the laboratory for experimentation and development of sensor applications in the firm’s stamping tooling, and then documented the status of dies and presses with respect to their unique needs for electronic sensors. Then Didricksen fully immersed himself into a rigorous set of intense experiments that has led to his mastery of inductive and photoelectric sensors, among others. As in all of the best metalforming shops I’ve visited that have developed a robust sensor program, Didricksen reached out and formed an Error-Proofing Technology Committee (EPTC), tasked with determining which areas with each die require sensing. The committee comprises members from several company departments, so ideas and opinions come from employees working in the pressroom, maintenance and engineering areas, among others. The committee’s decisions then are transformed into specific assignments for Didricksen, with clear deadlines for their completion. Of course, without the full support from company management—starting with Moders—all of the good work by Didricksen and the EPTC would be for naught. And Didricksen certainly appreciates the wholehearted support for his program, which has led to significant recent investment in new press controls that will help to modernize the company’s die-protection program. In parallel, vice president of operations Ken Wojcik maintains a close and extremely supportive role as Didricksen’s immediate boss, further reinforcing the notion that company management has Didricksen’s back when it comes to developing an industry-leading sensor program on all fronts. Toolroom personnel use the sensor test cart for verification of proper sensor cycling and target directions, before dies are installed in the pressroom. Didricksen’s laboratory is fully equipped with the critical equipment necessary for the proper testing of sensors before they are applied to a die. To this end, the laboratory includes a three-axis micro-positioning table with all of the appropriate ancillary devices including digital micrometers, fixtures and specialized mechanisms. The setup enables precise positioning of parts and sensors for experimentation, and thus allows Didricksen to accurately determine, with repeatability and reproducibility, the viability of any given sensor when detecting tooling and part targets. 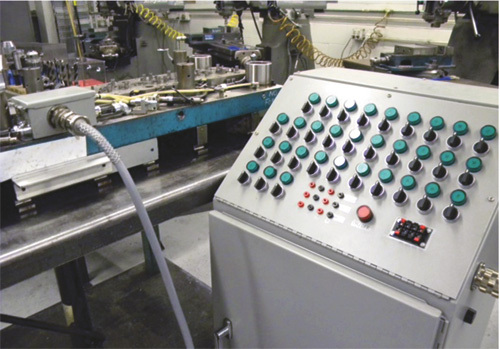 Kenmode’s toolmakers and pressroom personnel have access to the sensor test cart, built inhouse and providing an opportunity to toolmakers to verify that the sensors are functioning properly before they are installed into a production environment. Likewise, pressroom personnel use the test cart to verify that the sensors are working properly, and also can use it to troubleshoot any issues with the control-system setup. By being able to disconnect the die-protection control while the die remains in the press, and then connect the sensor test cart to the die, it becomes simple to isolate any malfunctions as being sensor- or controller-based. Kenmode Tool and Engineering now has its sights set on developing its in-die sensor expertise to enable automatic measurement and part-quality inspection, using analog sensors. This will allow it to monitor 100 percent of stamped parts for critical dimensions. After that would be the introduction of servo motors in its dies to automatically adjust the tooling based on the measurements from the analog sensors; then perhaps the pursuit of in-die welding.